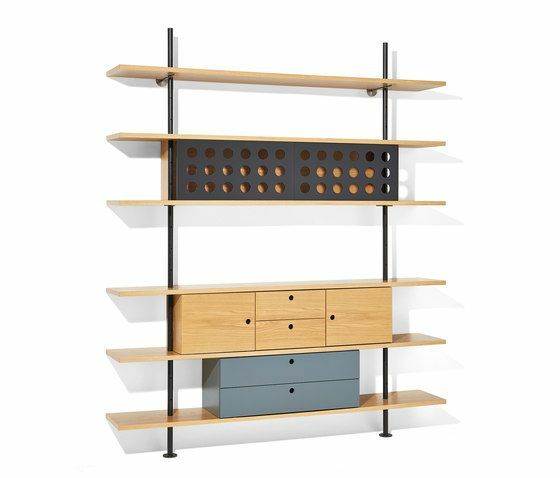 The Eiermann shelf is an archetype of shelving design. Egon Eiermann designed this shelf in 1932 for the much-acclaimed “The Growing House” exhibition in Berlin. The idea was to design a shelf for a home that can grow with the family. Thanks to a holistic approach, this also included the furniture. We have optimised both detailing and materials for modern requirements and production. The frame is available in stainless steel or in a powder-coated design in white, basalt grey or black. The shelves come in smoked or light oak, in bleached maple, white melamine or in a five-layer version stained with a small amount of white pigment. Available widths: 1400, 1600 and 2000 mm; up to 6 metres high. You can also have a matching integrated cabinet with sliding doors.